QUESTION: I have a mountain of clothing I need to wash in my washing machine. About 25% are whites and 75% are colored clothes. I need to save time and wash all the clothes together. Most of the clothes are for my children. I have a full time job and new baby. I have no time to sort the clothes. If I wash all the clothes together in just COLD water, will the other colors bleed into the white clothes? I have a top load Kenmore washer that works great but the tub is not that big. I am simply trying to save time. Any tips or tricks are appreciated. ANSWER: It is not a good idea to wash whites with colored clothes if you want your white clothes to stay white. Cold water washing will not make clothes bleed color like hot water will. Color transfer can still happen when using only cold water so it is best to keep colors and whites separated. You can attempt to wash your whites and colored clothes in your washer in COLD water AT THE SAME TIME, IF the colored clothes are old and the dye that colors them is faded. Colored clothing should be washed many times before washing with white clothes. Set your washer to the shortest wash cycle and the coldest water setting possible. Do not use excess detergent. Be sure no colored clothing is brand new when washing with white clothes. The excess color must be washed out of new clothes. This usually takes from 3 to 4 washes. Use a product called SHOUT COLOR CATCHER. Never wash brand new bold colored clothes with lightly colored clothes. The deep bold colors on on clothing is more likely to bleed onto lighter ones, more so when they are brand new. Washing in cold water can help but it isn’t a perfect solution. As an example: If you wash BRAND NEW black underwear with white tshirts, you will come away with gray T-shirts. If you wash a BRAND NEW red bra with white t-shirts, the t-shirts will turn pink. Most clothes when they are brand new will “bleed” color NO MATTER WHAT TEMPERATURE you use. Make sure to wash those items separately or with other clothes of a similar color. The outcome of the wash can depend on whether you have soft or hard water. If you have hard water, colors should be separated. Soft water does a better job to not let colors bleed as much but be cautious with the white clothes. You can try to wash clothes (unsorted) in cold. Sheets and towels in warm or hot water. Cloth diapers in hot water. Try using Bio-Kleen or Allens Naturally detergent and no fabric softener. If you have a new piece of dark clothing that looks like it may bleed color, do 3 or 4 individual separate dark color loads to make sure that all the dye bleeds away from that particular clothing item. 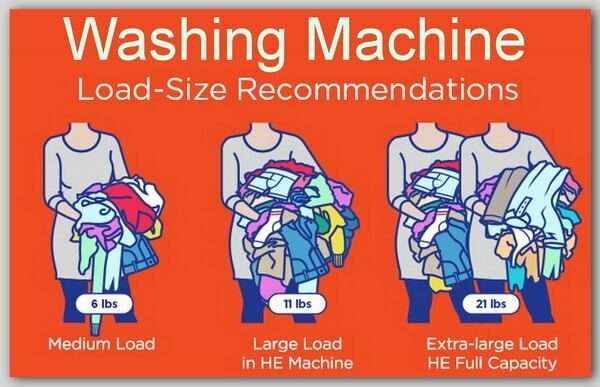 It may only take no more than 1 or 2 washes to “treat” the problem. Then, you can go back to the no sort rule and usually won’t have any color bleeding problems. 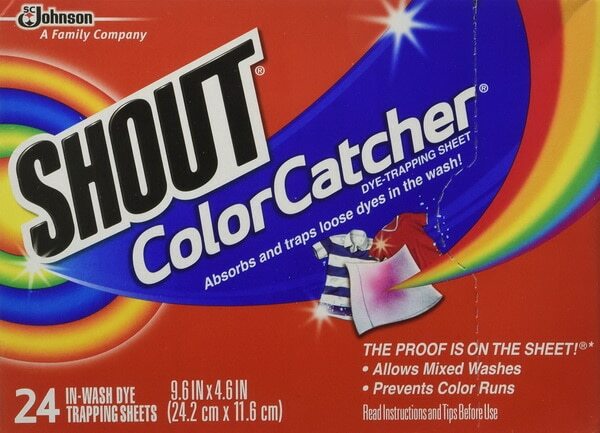 There is product called “Shout Color Catcher”. This product grabs some of the color that is in the water. Use a sheet in your laundry and you won’t have much dinginess if you mix colored clothes with white clothes. Shout Color Catcher Absorbs And Traps Loose Dyes To Keep Colors Vibrant. Shout Color Catcher is specially designed to work like a sponge. It absorbs and traps loose dyes in the wash, safely locking them away so they can’t redeposit on other clothes. 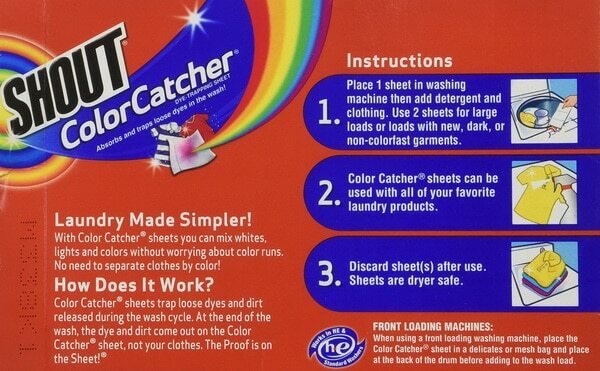 Shout Color Catcher keeps clothes looking vibrant and new, wash after wash. You can mix colors in the same load. Saves you time and money. Allows you to mix light, medium, and bright colours (greens, khakis, blues, and blacks). Keeps colors vibrant and brightens your whites. Works well on all fabrics, at all temperatures and with all laundry products. Do you have ideas or suggestions about a way to wash all clothes together that will reduce color bleeding? Please leave a comment below.